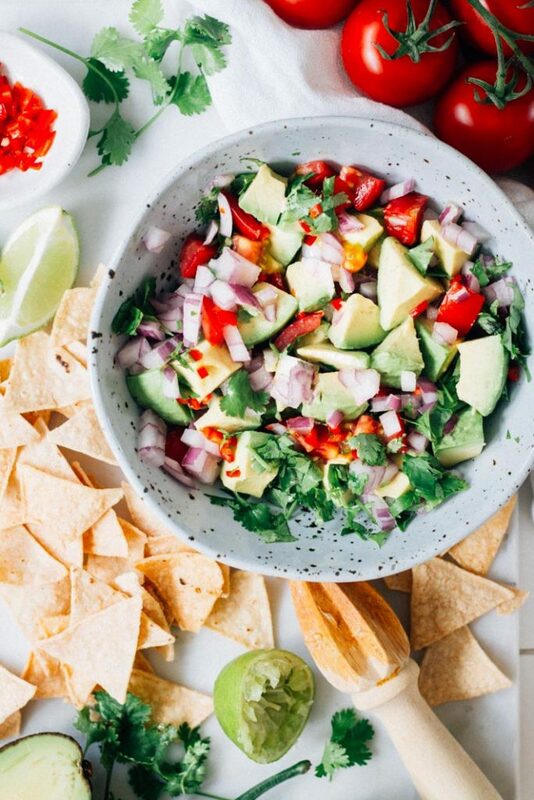 The perfect combination of avaocado, coriander (cilantro), tomato, onion, chili, and lime that’s super chunky and super easy to make. Jump to Recipe! Whoa! I’m sitting at my computer right now, not really knowing what to write. It’s all feeling a little foreign right now. Not only has it been soooooooo long since my last post (sorry folks), I’m also sitting in a new house. A lot has happened since I last visited My Little Larder. We bought a new house, we sold the old one, we went on holiday with our family and now we (almost) unpacked in our new house. All such wonderful things, but I am pooped! I am also very much enjoying getting back into a bit of a routine and back into creating lovely tasting things for all of you. 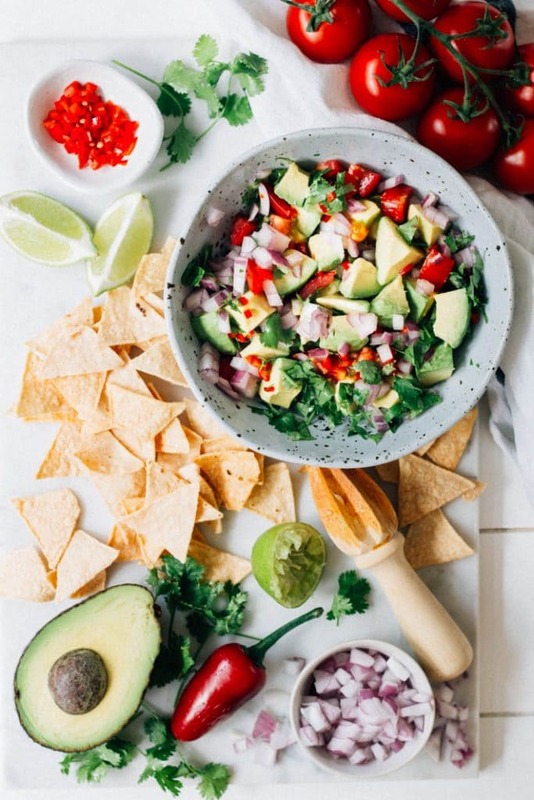 I have loved making this chunky guacamole throughout summer. It’s summery, it’s fresh, it’s full of creamy avocado and it’s seriously easy. I can get a little lazy on the chopping front sometimes so this is just my style, keepin’ in chunky and ‘rustic’. So I’ve been making it all summer in our intensely hot weather and thought it would be perfect to share. Except, this week when I go to post the recipe, there is a tropical cyclone and all I feel like eating is comforting winter food. It’s all stormy and rainy outside, still hot, but when it’s all rainy outside I start craving comfort food. Nevermind, it will no doubt be back to hot tomorrow with 99 percent humidity no doubt….and I will look like Monica from friends (in case you weren’t born in the ‘80s here’s what I mean). 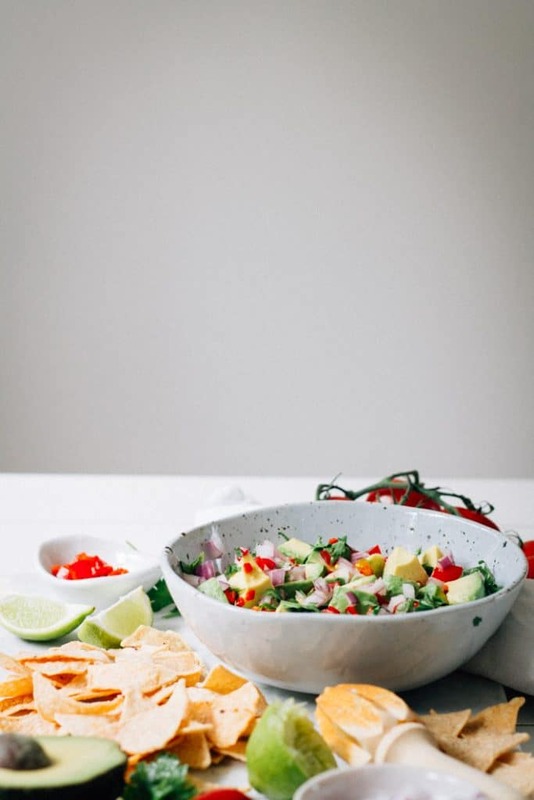 Loaded with avocado, tomato, chili, onion and (my fav) coriander (cilantro) this is one delicious dip, side, salad…. Now it may seem overly simple, and I bet if you’re anything like me you’re tempted to ditch the recipe and just ad lib. STOP! Before you go all rogue on me, stick to the recipe. I know, it seems overly simple but what makes it so good (apart from it being super easy to make because it’s all chunky) is the perfect balance of flavours. All the ingredients are perfectly balanced so trust me when I say, try it in these quantities….next time you can go rogue. Hopefully see you all soon! 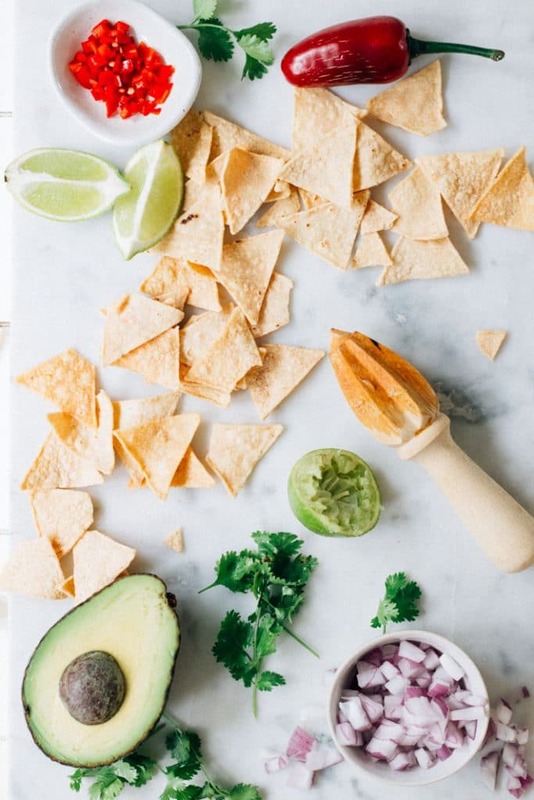 An easy and simple to make guacamole that is perfectly balanced in flavour! Combine all the ingredients in a medium bowl. Season, generously, to taste. 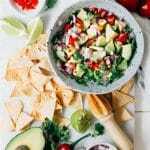 Serve alongside corn chips as a snack, on tacos, accompanying grilled fish or even as a side salad. Best eaten on the day of making. Note: I’ve suggested a jalapeño pepper, but any chili is fine, just check the heat first. If you make this, I would love to see! Tag your photo with #mylittlelarder on Instagram or Facebook or comment and leave some stars below! Thanks so much Karen, it’s lovely to be back! 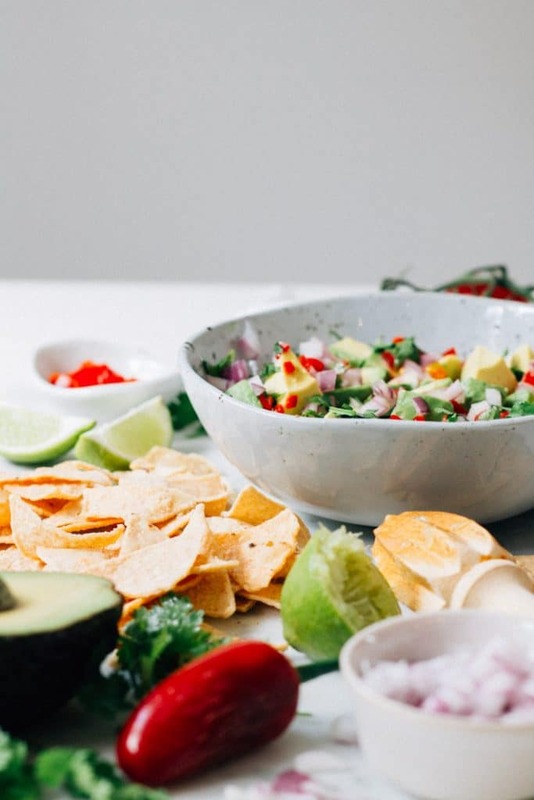 I bet you’re missing your avocados, but not long and it will be Summer up your way. 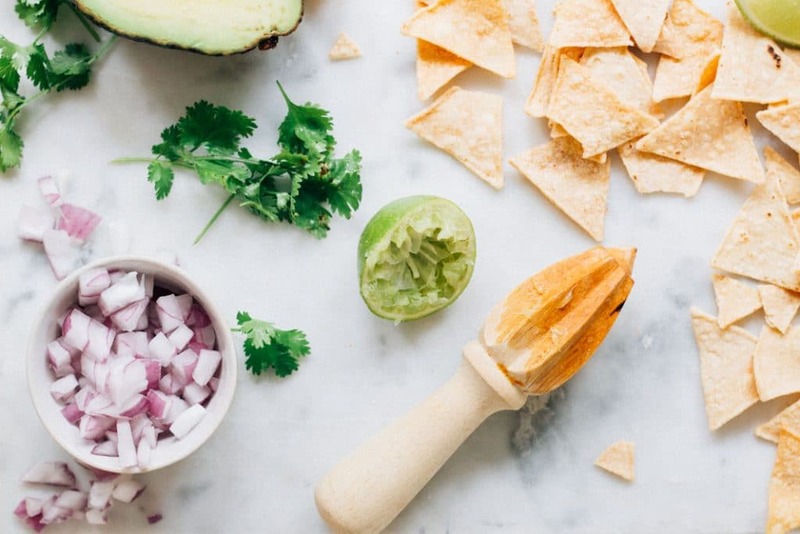 I totally get your red onion comment, I am not a big fan of raw onion but a tiny amount, cut up finely in this guacamole just seems to work for me. Thanks so much for stopping by to comment!